Usually I’d be positively bristling with anticipation at the prospect of getting around to the Arsenal, in the gorgeous Spring sunshine, following the comparative purgatory of a fortnight’s International break. Yet while the world battles the lack of empathy that’s been labelled “compassion fatigue”, we Gooners are suffering from “Wenger fatigue”, with us all fed up to the eye teeth with the pernicious aura of uncertainty that’s crippled our beloved club. A clash with a Man City side, intent on proving their superior purist pedigree should be cause for celebration, compared to all those other opponents who come to our place solely focused on snuffing out all hope of footballing entertainment. Yet with us going into Sunday’s game lagging a terrifying twelve points behind Spurs and with none of the current top four sides appearing to be in imminent peril of the wheels coming off in the finishing straight, it feels as if the vast majority of our fans have succumbed to a sense of apathy about our fate. 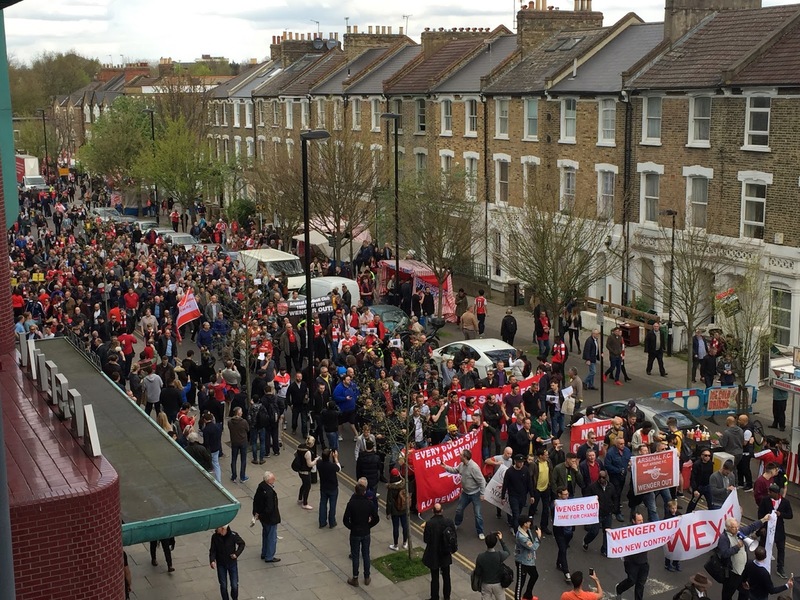 I assumed that our utterly dispirited displays prior to the break might give rise to a far more significant turn out for the now customary pre-match “Wenger Out” protest. 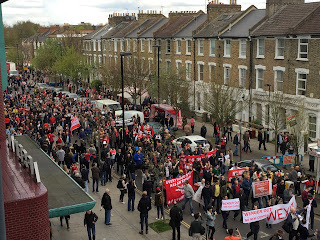 Yet Sunday’s demo appeared equally feeble as the humble gathering prior to our last home game against Lincoln. In spite of the sentiments of our chairman, which were splashed loudly across a traveling billboard concerning our manager’s accountability to the fans, I get the distinct sense that the bulk of the Arsenal faithful have resigned themselves to the futility of our position as punters. We’re merely the herd, to be milked as regularly as possible, for all our worth! Visiting City fans were enjoying the embarrassing spectacle of some of the more vociferous protestors offering out those Gooners who were giving vent to their support for Wenger. My instincts are that failing some sort of cataclysmic climax to this campaign, it’s already been decided that Arsène will extend his contract and the board have merely delayed any announcement to this effect, in an effort to try and time it, so that there are minimum opportunities for public expressions of outrage from all those Gooners who are clamouring for change. While the visiting fans made some effort to add a little atmosphere to Sunday’s proceedings, the remainder of the stadium was even more library-like than usual, with the home crowd seemingly content to sit back and watch the remainder of our season play out. Prior to the game, much of the speculation out on the concourse concerned how quickly the crowd might turn, if we conceded early and another humiliating defeat was on the cards. When Sane left Bellerin floundering in his wake and opened the scoring within five minutes and with Xhaka and Coquelin seemingly woefully inadequate in the middle of the park, it briefly looked as if City were capable of inflicting a cricket score. It was exasperating that it once again took for us to go a goal behind, before the Gunners pulled their collective fingers out, but I guess we must be grateful for the entertaining, end-to-end battle that ensued; especially when you consider that it took place amidst the sort of tepid atmosphere that might more normally be associated with the sort of unsatisfying, end of season, testimonial type affair. Ultimately a single point each only benefits our top-four competitors, but a significant defeat would’ve inflicted disastrous psychological damage upon our semifinal prospects. Sunday’s draw does at least offer some hope of us being able to rebuild our severely bruised morale. Besides which, 1-2 down at half-time, I would’ve bitten your hand off for a point, after seeing Gabriel going through an earnest warm-up. In light of how we’ve capitulated the last couple of times that Koscielny has been forced to limp off, I was positively terrified, as my worst fears were confirmed with his substitution. I pray his retirement was precautionary as with the games coming thick and fast, we’re going to need all hands on deck. And according to recent evidence Koscielny is the one player that we can least afford to lose, if this squad is to have any hope of doing their bit to affirm that our emperor isn’t in fact stark bollock naked.